After After a tiring hectic day what do you really need? A relaxing night’s sleep to cast out all the tiredness in the warmth of your fluffy bed, with a soft quilt and comfortable nightwear.. However to help our body relax choosing the right nightwear is extremely essential. It is extremely important to understand that all nightwear is not suited for everyone nor is it suited for every season. To pick the perfect nightwear one must reflect on the weather and season. Ideally in cooler conditions it is best to opt for full sleeved tops and pajamas whereas in warmer conditions, small sleeved tops and lightweight shorts or a long tank are perfect. Another very vital aspect while purchasing nightwear is the fabric that is suited as per the weather conditions. Cottons and Jerseys are light on the skin, ensuring that the material doesn’t stick to the skin allowing it to breathe freely. Thus Cottons and Jerseys are best for warmer conditions while heavier materials like Silk, Satin and Polyester are good for cooler climates. For a comfortable night’s sleep it is important that your night wear is relaxed enough for you to move freely. A little smaller in size will restrict your movements and a bit looser will pose a lot of obstructions, both causing uneasiness and distress. So choose the ones that are comfortable and feel good at the same time. Again the length of the nightwear is governed by the season or the weather conditions. For warmer conditions opt for shorter versions while for cooler conditions opt for the longer versions. However for special occasions something different that makes you feel glamorous works wonders too. Usually the colours you choose reflect your personality and the same goes with the nightwear. Having said that lighter colours are most liked for nightwear, however for children and young adults a lot of colour and print options are available to experiment with. 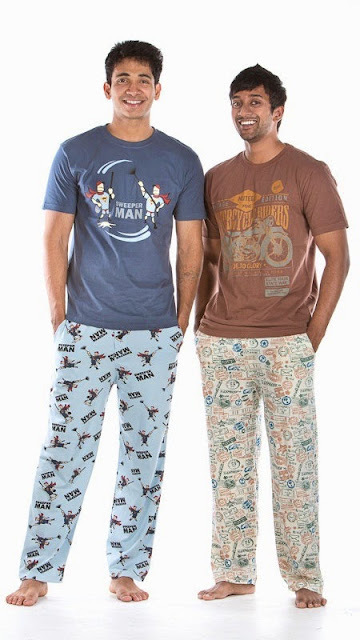 With these tips I’ve over the last few years experimented with buying nightwear online and chanced upon an amazing young brand Nuteez (pronounced as New – Teez) that offers casual and lounge wear for men, women and children. The brand has moved away from the traditional concept of nightwear and ventured into a more funky – lazy approach to the concept keeping the ethos of it intact. I especially like the quirk element in the products that adds character to the dressing down time. Made in India the products are designed by artists and designers from different parts of the country that highlights the soft peach hand finish that makes the products difficult to get out of. The products are designed keeping comfort and simplicity in mind, yet are extremely stylish adding to the persona and lifestyle of the wearer. You must check their website here. They are also coming up with the summer collection very soon, will keep you updated. Come back and tell me what you liked. Hmm, I don't specially buy pyjamas to wear. I'll just wear my worn out tee and fbt shorts.